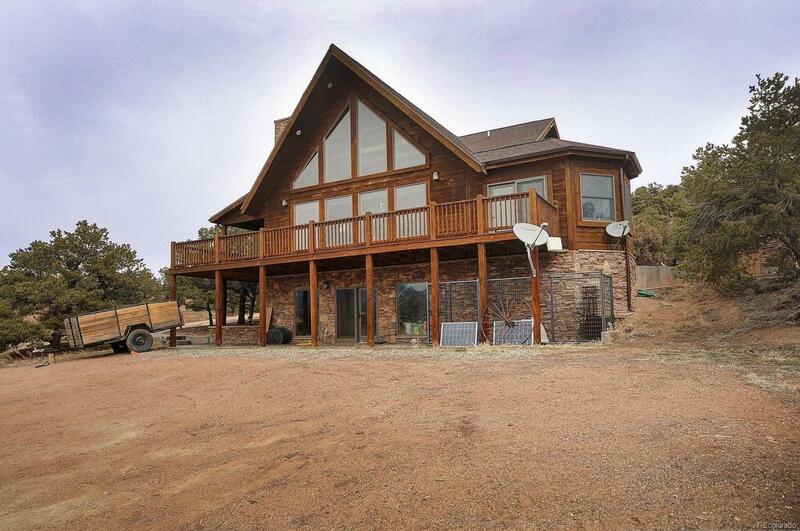 This is an awesome log cabin horse property. This Colorado home features beautiful hand hewn log construction with a wrap around deck. The master bedroom is on the main level with a 3/4 bath and gas insert stove. An exterior door off the master takes you out to the patio where the huge swim spa is located. The living room is cozy with enormous windows to take in the view. A wood stove with a blower will keep the whole main level nice and toasty. The entire interior is fully furnished on the main and upper levels. The walk-out basement is nearly 1300 sqft of partially finished space with a bedroom, kitchenette, living room with a massive fireplace ready to be completed. With nearly 40 acres of land, this location is perfect for horses. There are fences, corrals, and a tack room already in place. The views from where the home was strategically placed on the lot are absolutely phenomenal. Some ditch rights come with the sale as well. Come see this one today!